(A)ll updates, (N)o updates or (S)elect a single update? If I install all updates, the first succeeds (1.255.252.0) and the second fails (1.257.1005.0). Trying again, it only lists the second update (1.257.1005.0) and I can install this successfully. So, if I check for updates again at this point, it should say “There are no applicable updates.” However, it actually lists definition 1.255.252.0 again! After that, it goes in an infinite loop: each time I install one of the definition updates, it asks for the other afterwards. 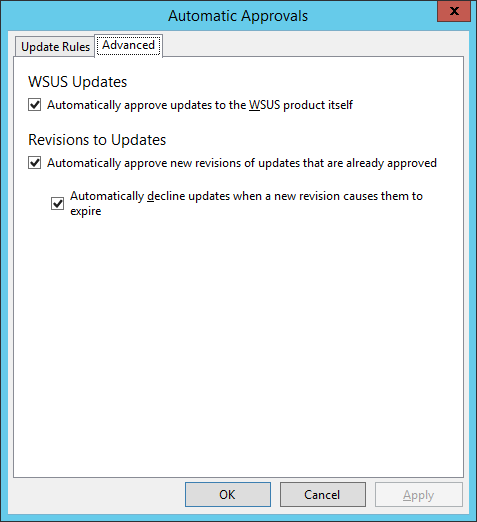 However, that doesn’t seem to be working; maybe it will only decline updates if they’re in a “Not Approved” state? After I manually declined this update, I checked for updates again on the Windows Server 2016 machine, and this time it didn’t find anything to install. I suspect this means that the problem won’t be limited to this specific (old) definition update, and I may have to manually decline more of them on an ongoing basis.